On Friday November 1, 2019, how will you pay it forward? The first Friday of November each year is Random Act of Kindness Day®. Since 2008, this special day has brought Canadian communities together by engaging citizens in small acts of kindness and generosity. Durham Community Foundation invites you to either collect healthy non-perishable food items and donate them to your local food bank, or collect gently used clothing or winter gear like toques, mitts & socks, and donate them to your local shelter. On Monday October 28, 2019, help us spread the word by printing and posting our poster at your office, organization or school. On Friday November 1, 2019 share your organization’s Random Act of Kindness Day® act on our Foundation’s Facebook page between 9:00 am and 5:00 pm for a chance to win $500, for your favourite registered charity in the Region of Durham. Please note that the $500 donation is made possible by The Pension Specialists, as a result, they have final approval on the designated charity. Simple acts of kindness are endless – use your imagination and follow your heart. 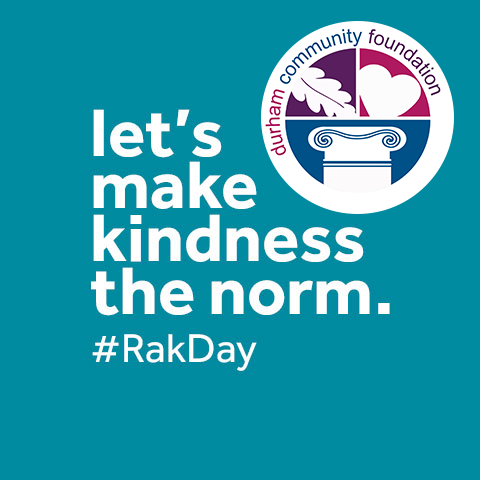 Please register with us so we can share your RAK Day plans through social media. Random Act of Kindness Day® is a kindness movement, and a collaboration between Community Foundations across Canada and The Random Acts of Kindness Foundation.